While kittens are amazing and adorable, they are hard work. In fact, the whole process of your cat being pregnant and taking care of the little babies can be stressful. And once they are old enough, you have to find new owners. And this can be a challenge to find someone to take them off your hands. You also worry about what kind of life they might have when you give them away. But you can’t keep them on as it’s difficult to look after several cats. That's why a lot of people go down the route of spaying their cat but doesn't really have any idea how much does it cost to get a cat spayed. Furthermore, they then won’t have to worry about having their cat outside or around your other male cats. There will be no chance of the feline getting pregnant and you having to deal with a litter of kittens. Also, spaying has other health benefits. A cat that has been neutered is less likely to catch leukemia as they are unlikely to get into fights. Also, if cat isn’t spayed, then they are at higher risk of a uterine infection. This can lead to their death if it’s not treated quickly. Therefore, by getting spayed, it removes the risk of this. Also, by getting your cat neutered, you don’t have to worry about your furry friend going through seasons. After all, when your female cat is going through a season, you can expect male cats flocking to your garden; their behavior such as urinating and constant meowing can be stressful. Despite the many benefits, a lot of people are still put off getting their cat spayed. They don’t really understand the process and have many questions such as how much it costs to get a cat spayed and how old to spay a cat. Therefore, carry on reading for more information on what you need to know about spaying your cat. How Old Should a Cat be When You Get Them Neutered? How Can You Help Them Recover? A lot of pet owners are put off getting their cat spayed due to the cost. After all, they worry it’s going to cost hundreds of dollars. But it really does vary depending on where you get it done, so it might not be out of your budget. The cost of getting your feline neutered is around $300 for a female cat. This includes the charge for any medications they need, plus the general anesthetic which will be used for the cat’s operation. You can also expect a pre-appointment to discuss what they need to do as part of the package too. It’s slightly less when it comes to a male cat; the cost can vary between $100-200 when it comes to your male. There are ways you can complete the op for cheaper. For one thing, some non-profit organizations can often do the procedure for a lower cost. In fact, if you are on a lower income, you will likely get the opportunity to do the operation for a fraction of the price. Same goes for declawing a cat and other vet operations. e day, they are going to have rehome unwanted cats if you let your pet breed. So it benefits them in some cases to reduce the fees for the operation. Also, some vets offer a package when you first get your cat which includes their first vaccinations and cat spaying. Doing this often works out a lot cheaper than just doing the surgery. And you could also consider doing the op via your pet insurance. After all, if you are taking out a plan, it often covers spaying surgery, so you might not have to pay much out if you do the op through this. The subject can also leave people confused about when they should get their cat spayed. 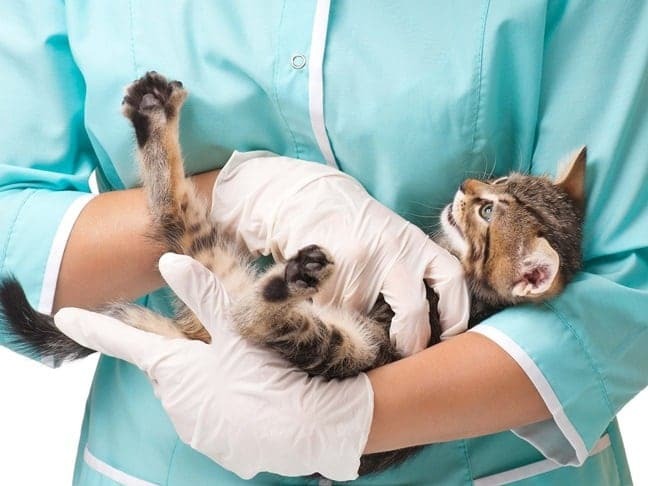 After all, they don’t want to put a kitten through the procedure when they are too little. But they also don’t want to leave it too late so they go through a season and then end up getting pregnant. The best age that vets recommend taking your feline to get spayed is when they around four to five months. You might feel like they are still little, but it’s best to catch them when they are little before they are ready to produce kittens. And if you want to let them be outdoor cats, you should definitely get them spayed before you let them out. If you have missed the boat, it’s still okay to take your cat when they are older. Cats can get spayed at any age over four months, so it’s still worth taking your cat, even if it’s a couple of years old. It can also be worrying when it comes to helping your cat recover. After all, you don’t want to do anything which is going to prolong their pain. The first thing you need to know is your cat is likely to come home the same day. They might be quite lethargic over the next 24 hours. The best thing you can do for your cat is to keep the area clean while they recover. It can take around 10 days for the skin to heal after your cat has been in to be spayed. Additionally, you need to make sure they don’t lick the area. This can be a challenge. Some people end up having their cat wear a cone to stop them from licking the area. While people worry it’s cruel, it will help them in their recovery, so if you cat won’t stop licking, it’s worth asking your vet about one. Also, make sure your cat stays inside during their recovery. That way, you can ensure they don’t hurt themselves, and you can keep an eye on how much they are licking the area. You will then go and see the vet for a post-op check and then you can discuss any concerns you may have about your feline’s recovery. Hopefully, everything will go well and then your cat will be ready to play again soon.